Three soldiers are standing guard at the river. Not a particularly dramatic situation – more a sort of Waiting for Godot. Where is the enemy? Why all this fuss? The documentary sets out in search of the „conflict“ between the Republic of Moldova and Transnistria. Starting from the observation at the tri-lateral post, the film zooms outward onto the political level: into the negotiation rooms of local politicians and onto the international stage. Under Germany`s OSCE chairmanship in 2016, the dialogue, which had collapsed since the Ukraine crisis, was resumed. 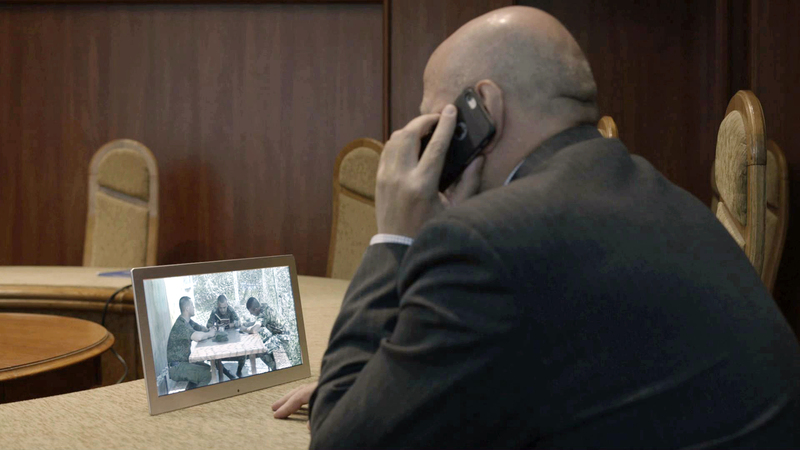 The film considers the Transnistrian conflict as prototypical for the East-West relations. Intertwining big and small narratives, the film searches for basic patterns that keep the conflict alive and determine our thinking. The documentary is part of the film project Posten Nr. 6 that was supported by the Stiftung Kunstfonds, the Robert Bosch Stiftung, the Berlin Senate Department for Culture and Europe and the Deutsch-Moldauisches Forum e.V.